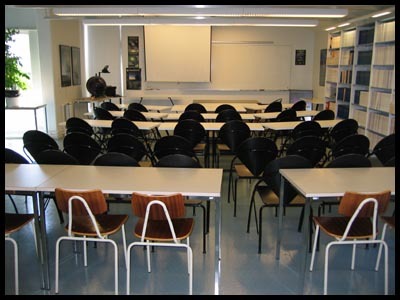 Main use of the Tuorla Observatory lecture hall is in academic teaching and conferencing, and other events organised by the observatory. The hall is also rented for others, when it is free from the observatory use. 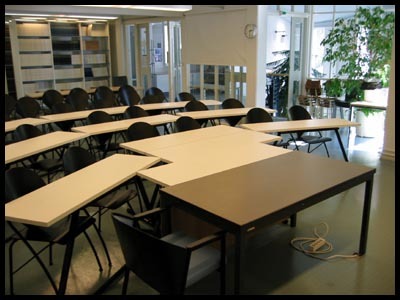 The (absolute) maximum capacity of the lecture hall is 60 people; or 36 people, if each person has a table seat. Tables may be placed in almost any configuration. However, please see below the lecture hall rules of use. The rent varies depending on the equipment requirements and need to change the table configuration. An overhead projector and a data projector are available for use in the hall. The data projector may be used at screen resolutions of 1152×864, 1024×768 (XGA) and 800×600 pixels. Similarily a computer with Internet connection can be arranged. Tuorla Observatory is a unit of the University of Turku with a duty to perform scientific research. We rent our lecture hall for anybody seeking an exotic and peaceful place to hold a meeting. However, we require the following simple rules to be followed. 1) The people renting the lecture room must attend to the needs of observatory staff to conduct its scientific research in peace. Hence it is forbidden to use any sound reproduction equipment or other loud electrical or mechanical appliances. It is forbidden to sing or play music and it is also forbidden to move needlessly outside the lecture hall - especially in large groups. 2) The lecture hall is rented out at an unusually low price. An extra charge will be added to those reservations stating a need to change the table or seating order. If changes are made without prior request, an extra 50 euro cleaning fee will be added to the bill. 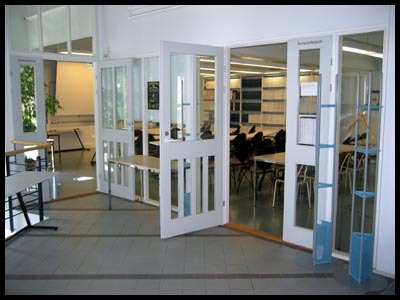 3) Doors of the lecture hall must be kept closed when using the hall. There is machine assisted ventilation in the lecture hall. This may not be powerful enough during hot weather. If that is the case, we should be contacted in order to open the window of the hall. We thank you for understanding these basic rules!